The origin of the Pignatelli Aragona Cortes ("PAC") branch of the family is linked to James I, King of Aragon 1208-1276. His direct descendant, Federico, 3.rd King of Sicily (1250-1296), had a common law son, Orlando d'Aragona (b. 1280,) who became Viceroy of Sicily and was given the title of Signore (Lord) di Avola, later elevated to Marques of Avola. Maria Concessa d'Aragona (probably around the year 1500 AD)- the only surviving descendant of Orlando d'Aragona - married Giovanni Tagliavia, first Marchese and later Duca di Terranova, who became - on the basis of Spanish law (i.e. the daughters transmitted titles and estates if there were no male heirs) - Giovanni d'Aragona Tagliavia. In 1648 Diego - a direct descendant of said Giovanni - married Stefania Cortes, the only surviving descendant of Hernan Cortes,( see Genealogy of Hernando Cortes ) the Conqueror of Mexico, and thus became Diego d'Aragona Cortes Tagliavia. Diego and Stefania's daughter, Giovanna, married Ettore IV Pignatelli (1620-1674) who thus became Ettore Pignatelli Aragona Cortes. The surname of Tagliavia was dropped at that time, rather unfairly, as several, but indeed not all, of the properties and titles - including the title of Prince of the Holy Empire - came to the Pignatellis (the "PAC" branch) via the family Tagliavia Aragona Cortes. Their son, Andrea Fabrizio ("P.A.C.") (1640-1677), inherited all titles and properties of the Tagliavias, the Aragonas and the Cortes in Italy, Sicily, Spain and Mexico. Andrea Fabrizio's only daughter, Giovanna II (1666-1723), married Nicolo' II (1648-1730), Viceroy of Sardinia and Sicily, who rebuilt the city of Avola, which was destroyed around the year 1700 by an earthquake. Nicolo II and Giovanna II ("PAC") had consequently acquired extensive feudal properties in Southern Italy, in central and western Sicily, in Spain and Mexico. Among those properties, was also the Cortes' Palace of Cuernavaca which remained part of the Pignatellis' ("PAC") estate into the 20th century. Cortes had built his palace there in 1529 after he was granted by the Spanish crown, as an award for his conquests, a huge tract of land which included all of the present state of Morelos, all the Indians then living on the land, the title of Marquis of the Valley of Oaxaca and power of life and death over all the souls on his domains. The very last Cortes' property in Mexico was expropriated during W.W.II, in March 1942, when Mexico, allied to the USA, declared war to Italy. Giuseppe ("P.A.C. "), (1795-1859), Duca di Terranova and Marques de la Valle de Oaxaca, had two sons, Diego sr., who died without children, and Antonio (1827-1881) who had three sons. Diego sr. bought in 1848 from the Rothchilds the Villa Acton in Naples, which is now Villa Pignatelli, and left it at his death to his nephew Diego (1862-1930): it has become in 1961 the Museum Diego Aragona Pignatelli Cortes as a result of the donation of the Villa to the State by Annamaria ("PAC"), his daughter. Giuseppe (Peppino), the aforementioned Senator and head of the "PAC" family, had two daughters (who died without children) and one son, Antonio (1892-1962). Antonio's only son, Giuseppe (Pepito), died without children in 1984 and Antonio's only surviving daughter is Maria Gloria (Lola), married Child-Villiers. The aforementioned Fabrizio (1897-1953) had three children: Carlo (born in 1921 died in 1933), Nicolo' (born in 1923) - who has one daughter Fabrizia (b. 1956) and one son Diego (b. 1958) from his marriage in 1954 (an. 1968) with Luciana Malgeri and two sons, Ascanio (b.1970) and Adriano (b.1972) from his marriage in 1969 with Mary Susan Morton - and a daughter Giovanna Alfonsa (b. 1933 - d. 2000) who had three sons: Fabrice and Olivier Doria d'Angri and Thierry Bruneau. Because of the described circumstances, Fabrizio's only surviving son, Nicolo', has become the head of the Pignatelli Aragona Cortes branch of the family. Lucio Pignatelli - founder and first member of the Pignatelli family - was Great Constable of the Dukedom of Naples in 1102 AD. Rodolfo, was Counselor of the Norman King, William the Wise, and his ambassador in 1156 to Pope Adrian IV for the investiture of the Kingdom of Sicily. Bartolomeo Pignatelli, Bishop of Cosenza, mentioned in the Purgatory of Dante's Divine Commedy, was ambassador of Pope Bonifazio VIII in 1264 to the King of France for the purpose of inviting Charles of Anjou to become King of Naples. Ettore I (b. 1465-1535) 1.st Duca di Monteleone, Capitan General of Emperor Charles V and viceroy of Sicily. He remained famous for his valour in war against the French and for the draconian repressions of various rebellions carried out under his leadership in Sicily and in Monteleone. Fabrizio (circa 1510-1570) Knight of Justice and Lieutenant General and Great Prior of the Sovereign Order of Malta. He fought the Turkish pirates in Southern Italy and the French armies in Sicily. He founded the famous Pellegrini Hospital in Naples. Ettore II, Duca di Monteleone (circa 1585- 1615), Grandee of Spain, Knight of the Toson d'Oro, Captain General of Spain and Viceroy of Catalunja. Fra' Tommaso Pignatelli (1605-1634), Dominican monk, was the common law son of the Principe di Noja. After being repeatedly tortured in order to extract from him a confession - an unsuccessful attempt - the High Court of Inquisition found him guilty of alleged rebellion against the Spaniards and alleged heresy and was executed with the "garrota" in the Castel dell'Ovo in Naples. Nicolo' (1648-1730), Grandee of Spain, Captain General and Viceroy of Sicily, Grand Admiral and Great Constable of the Kingdom of Spain. Cardinal Antonio Pignatelli, former Apostolic Delegate to Poland and later Archbishop of Naples, was elected Pope in 1691 as Innocent XII. He issued the "Bulla" abolishing nepotism and remained famous also for the public works carried out under his reign, such as: the ports of Civitavecchia and Anzio, near Rome, the Via Appia Pignatelli, a road parallel to the Ancient Appian Way, the road leading up to the Campidoglio in Rome, the Palace of Montecitorio - presently housing the Italian Parliament - the huge home for the old age people along the river Tiber: San Michele, the restoration of the road leading up to the Rome Capitol Hill. Don Ramon Pignatelli ("PAC") Fuentes built in Saragoza (Spain) a huge and impressive palace, commonly called "El Pignatelli". It is presently the seat of the Generalidad (i.e. Government) of the Aragona Region. Saint Joseph Pignatelli (1737-1811), Gesuit, of the Pignatelli Aragona Cortes y Fuentes - the Spanish branch - whom the Gesuit Order regards as the second founder (in 1805) of the Gesuit Order which had been disbanned in the early 1700.
the Sacred College of Cardinals (1948-1950). As mentioned earlier, several members of the Pignatelli Aragona Cortes were Grandees of Spain, Viceroys of Sicily, Sardinia, Catalunja, Grand Admirals of the Spanish Kingdom and ten of them, between 1585 and 1801, received - for services rendered to the Holy Roman Empire, to Spain and to the Kingdom of the Two Sicilies - the Order of the Toson d'Oro, the highest recognition then awarded by Holy Roman Emperors and Kings of Spain. The Pignatelli Aragona Cortes acquired the right to display the Toson d'Oro on the family coat of arms. The motto in Latin of the Pignatelli Aragona Cortes family was inherited from Hernan Cortes: "Iudicium Domini apprehended eos et fortitude eius corroboravit brachium meum". 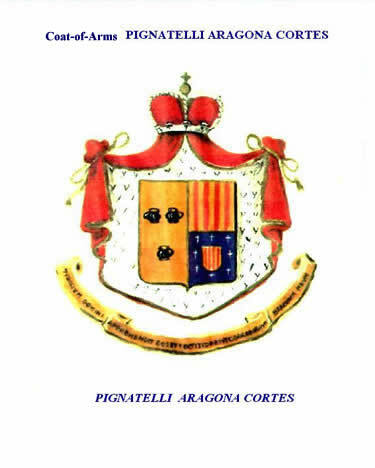 Note: All original documents supporting the above lineage of the Pignatelli Aragona Cortes family can be found in the family archives which have been donated in 1961 by the mentioned Nicolo' ("PAC") and his aunt Annamaria to the Archivio di Stato in Naples in 1961. 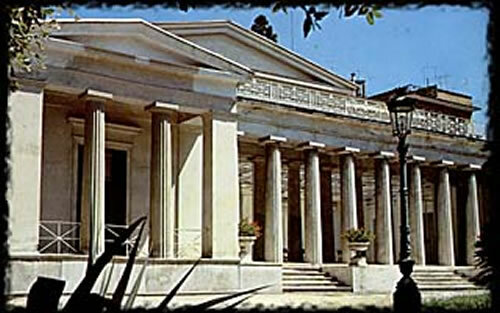 Villa Pignatelli is the only Neapolitan model of house-museum,erected in 1826 as residence of the Acton family , in 1841 passed to the Rotschild and after the unification of Italy in 1867 , The Prince Diego Pignatelli Aragona Cortes acquired the villa , in 1962 the daughter Anna Maria Pignatelli Aragona Cortes donated to the Italian State as Museum.